I love my hair right after I leave the salon. It smells, looks, and feels amazing. And over the next few days, I try to hold onto that good hair juju as long as possible. I take baths, use a ton of dry shampoo, and definitely skip any sort of sweat sessions at the gym. But after about a week, the inevitable happens — I need a real shampoo. And like that, my amazing hair is gone. Check out eight hair cocktails for salon-worthy style. I’ve tried to recapture that salon feeling and style on my own, but it’s not the same. I use the same tools and I do the same steps, but my hair never looks as good as when I leave my stylist. Then, it occurred to me. Unlike me, my stylist never uses just one hairstyle product. Nope, she’s like a chef in the kitchen. Mixing a few different products for my hair in the palms of her hands, creating a personalized hair cocktail. Could that be the secret? 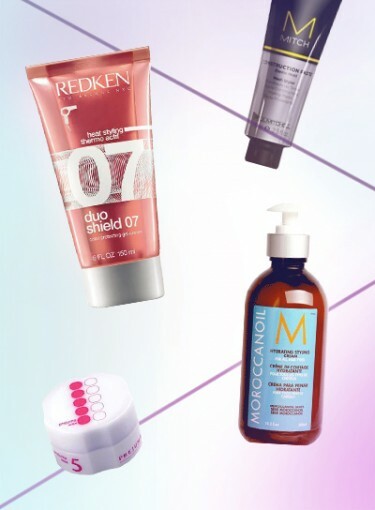 Is salon-worthy hair really the result of a specific hair product combo? The top stylists in the country say yes, and luckily for us, they were willing to share their favorite recipes. From a frizz-free shiny hair masterpiece to the perfect blowout, these hair cocktails are the key to recapturing that amazing, just stepped out of the salon feel and look. Are you ready to give them a try? Click ahead to find your own hair cocktail.